This head-to-head pits Linksys' PLE500 Powerline 1-port Gigabit Ethernet Adapter vs. ZyXEL's PLA5205 600 Mbps Powerline Gigabit Ethernet Adapter. Both products are the first to ship using Qualcomm Atheros' QCA7450 / AR1540 HomePlug AV2 chipset announced in October 2012. Linksys makes the PLE500 available only as part of the two-adapter PLEK500 kit. ZyXEL sells the PLA5205 individually, but also as part of a PLA5205KIT. Both will cost you around $120 for the two-adapter kit and the PLA5205 alone runs $70. Both products are physically very similar with a single 10/100/1000 Ethernet port on their bottom edge (not visible in the photo below). You can see that both are sized so that they will not block the other outlet in a standard U.S. duplex outlet. Both have three-prong outlets on their backside. The ground prong isn't just there for safety—it's actually used for signal transmission. This trick is used more in the MIMO form of AV2, which I'll touch upon shortly. Note that despite the U.S. plug, both products are rated from 100 - 240 VAC. ZyXEL has posted only a preliminary manual for its product. But the products are similar enough that the PLE500's diagram from its User Guide is applicable enough for both products. One possible difference is that ZyXEL says that its HomePlug indicator supports the Green / Amber / Red connection quality feature that is standard on "AV 500" devices, as shown in the table taken from its user guide below. Linksys makes no mention of this feature in its documentation. I've never paid much attention to this feature, so plugged one adapter into my office, which is behind a throughput-killing AFCI breaker, and walked another around to various outlets. Both adapters showed a green powerline / HomePlug light, even when plugged into an outlet in my detached garage! 500 Mbps or 600 Mbps? You'll notice the "500" in Linksys' product name, which alludes to the "Technology: Homeplug AV2 500 Mbps" in its specification. ZyXEL, on the other hand, quotes a 600 Mbps transmit/receive data transfer rate in the PLA5205's spec. If both are based on AV2, why the difference? First, to recap, remember that "500 Mbps" HomePlug AV—which is not an official HomePlug spec—gets its extra throughput by using a wider frequency spectrum (2 to 68 MHz) than the 2 to 30 MHz spectrum that standard (200 Mbps) HomePlug AV uses. According to this diagram from the HomePlug Alliance, AV2 expands the spectrum even more, out to 86 MHz. Note also that there are two forms of AV2—SISO (Single Input Single Output) and MIMO (Multiple Input Multiple Output). Homeplug AV2 uses a lot of the technology used in 802.11n and ac wireless, including OFDM, MIMO and even beamforming! I reached out to ZyXEL and Qualcomm Atheros for an explanation of ZyXEL's 600 Mbps claim. Q-A sent the diagram below, which reveals two SISO and three MIMO bandwidth profiles. But note that Q-A supports only the SISO-500 profile in its current chipset, which is used in both products. However, our silicon is capable of delivering up to 600 Mbps if the HW design has the lowest noise profile. So, customers who are able to do a good design can realize the 600 Mbps rates. So we can call ourselves SISO-500+. ZyXEL apparently thought "600 Mbps" sounded better than SISO-500+ and went for it. And since ZyXEL's adapters are not HomePlug Certified, I guess they can claim what they want. Note that Linksys' adapter is HomePlug Certified, but only against AV, not AV2. The adapters were both easy to open, although the Linksys required a bit more prying once the single screw covered by its rear label was peeled away. The designs are so similar that I thought it best to show the boards side-by-side in the photo below. The large device is a QCA7450 with the much smaller AR1540 analog front end sitting to its upper right. That's an Atheros AR8035-A single-port 10/100/1000 Ethernet PHY sitting right next to the Ethernet connector. While the boards are not identical, I imagine they don't deviate very far from Qualcomm Atheros' reference design. Like HomePlug AV, AV2 devices are protected with 128 bit AES encryption and come set with the same default key, so you can just plug and play. All AV2 devices have buttons that can be used to change the security code. Setting the code works like setting up a Wi-Fi WPS connection. You press the button on one device until a LED starts blinking. You then have two minutes to press the button on a second adapter to complete the setting. The ZyXEL came with a utility on a CD. Linksys also supplied a CD, but it contained only documentation. You can, however, download its utility (Windows or MacOS), which is shown below. Both utilities rely on WinPCap, which they will automatically install if your system doesn't already have it. Both utilities detected each other's adapters and provided the same features. They differ mainly in presentation format. So if you don't like the utility that came with your adapter, hit the product support page for the other product, download and install its utility and enjoy! I used the ZyXEL utility to grab the firmware version for both products. The PLE500's info is shown below, so that you can compare to the Linksys utility's presenatation of the same information above. Comparing with the ZyXEL's firmware version shown below shows the Linksys uses a slightly later version. I tested all the adapters at three locations in my home using this procedure. Pairs of the same make/model adapters that came in each kit were tested with separate up and downlink tests at each of three test locations. Simultaneous up/downlink and four-stream tests were also run at Location A. All results were entered into the Powerline Performance Charts. The Downlink Throughput plot below shows both the AV2 products start out with almost a 2-to-1 throughput advantage over the AV 500 products. The Linksys measured a bit higher at 240 Mbps vs. the ZyXEL's 222 Mbps. Remember, "Location A" represents performance with both adapters plugged into the same outlet strip; hardly a real-world use scenario. Moving to Location C, which represents a more typical floor-to-floor deployment, we see that throughput has dropped considerably to the 90 - 100 Mbps range for both adapters. This is still better than the AV 500 products that produced throughputs of 61 and 75 Mbps. The best news for the AV2 adapters is that their downlink throughput seemed to hold up better than the AV 500 products at worst-case Location E. Both AV2 adapters produced mid 70 Mbps throughput vs. 47 Mbps best case for the AV 500 products. The IxChariot plot below summarizing the downlink runs for the PLE500 shows a throughput jump around 10 seconds into the test for Location A. This is very similar to what I've found testing draft 802.11ac wireless products. Although Location A throughput is relatively stable, there is more variation than seen at the other test locations. But a good deal of this is probably averaging due to not changing the test file size as throughput dropped. Here's the downlink plot for the ZyXEL PLA5205 pair. We again get a similar jump up toward the start of the Location A test. There is also some cyclical variation that we didn't see in the Linksys plot. Turning to uplink, we see a much different performance picture. The Linksys manages only a slight advantage over the AV 500 products at Location A, producing 142 Mbps vs. their 131 Mbps. In contrast, the PLA5205 stays up at 223 Mbps; almost identical to its downlink results. It's surprising to see very little difference between the AV2 and AV 500 products at Location C. All four results fell into a 10 Mbps band from 75 to 85 Mbps. At least both AV2 products once again out-performed the AV 500 pair, coming in at 73 Mbps vs. 42 - 46 Mbps. The IxChariot plot below summarizing the uplink runs for the PLE500 once again shows the throughput bump-up near the start of the run. But this time, throughput both starts out lower (120 Mbps vs. 150 Mbps for downlink) and rises only to 145 Mbps or so. The ZyXEL PLA5205 uplink plot looks almost the same as downlink. If you don't like my choices for comparison, use the Powerline Charts and run your own. I've found that both 200 and 500 Mbps flavors of HomePlug AV can produce higher total bandwidth from multiple streams that you can get from a single stream. AV2, however, seems to provide only a moderate throughput gain from multiple streams. Here's the simultaneous uplink / downlink plot for the Linksys PLE500. The 267 Mbps total is only moderately higher than the best-case 240 Mbps Location A downlink result. The uplink / downlink throughput imbalance is also reflected in the simultaneous test. The same test for the ZyXEL had about the same total throughput as the Linksys at 262 Mbps, with a similar moderate gain over its best-base 223 Mbps unidirectional results. In contrast with the Linksys, the ZyXEL has a much more equal distribution between up and downlink. It's nice that we finally have an "official" 500 Mbps powerline standard. But since all the "AV 500" adapters used the same Qualcomm Atheros AR1500/AR7400 chipset, AV 500 was a de facto standard anyway. 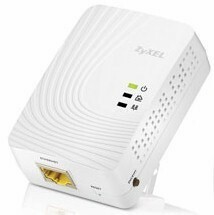 So are a pair of AV2 500 Mbps (or 600 Mbps as ZyXEL claims) adapters at $120 worth twice the cost of an AV 500 pair? I can only say...maybe. It is true that these two sets of AV2 adapters are capable of almost twice the maximum throughput of most of the AV 500 adapters we tested almost two years ago. But that throughput is obtained only with a same-outlet case that doesn't reflect real-world use. When the adapters are compared under more typical conditions (our Location C case), both the Linksys and ZyXEL AV2 adapters would be indistinguishable from AV 500 adapters, albeit producing around 80 Mbps of usable throughput. The only real-world advantage our testing has revealed is a significant (almost 2X) throughput advantage for widely-separated adapters (our Location E case). The ~75 Mbps throughput we got with the AV2 adapters might make the difference for uncompressed Blu-ray streaming over a pair of AV 500 adapters supporting only around 40 Mbps. In the end, my advice is similar to that offered at the end of the AV 500 roundup. First try a pair of AV 500 adapters and move up to either of these AV2 adapters if the AV 500 adapters don't produce the throughput that you want. The additional signal processing magic and techniques in AV2 just might eke out the performance that you need. ZyXEL Announces Speedier Homeplug AV2 Adapters?